John Kelly of the Irish Citizen Army (back centre), and what appears to be young ICA scouts at the front. I have come across reference to several scouting groups during the revolutionary period and the ICA scouts are one of them. There were a number of active (and some not so active) groups, nationalist and non-nationalist including Irish National Guards, Imperial Cadet Corps, Baden Powell Scouts, Boys Brigade, Fianna Phadraig and ICA scouts. There might have been others that I don’t know of. 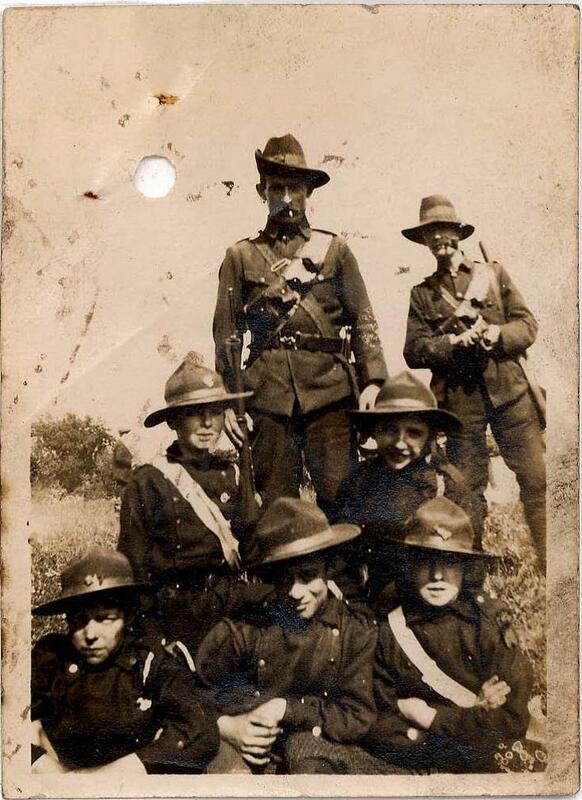 As far as I know the Irish Citizen Army (ICA) Scouts were formed in June 1914. The inspiration for these scouts was also Countess Markievicz. The hall she rented at Camden Street for Na Fianna Eireann was also used by both the ICA and the ICA scouts at various times. In June 1914 Markievicz, Michael Mallin and Seamus McGowan organized a get together of young boys at Croydon Park. They were mostly sons of ICA and union members. Markievicz spoke to the young boys and suggested the formation of an ICA scouting corps. They would train at Liberty Hall (and also Camden Street) and be the ‘youth wing’ of the ICA. As far as I know about twenty boys signed up that day or soon after. Walter Carpenter was appointed as the first captain or O/C of the ICA scouts, Charlie D’Arcy and Paddy Carroll were his senior officers. Drilling and first aid training was held, with some help from the Fianna for the drilling and Dr. Kathleen Lynn was asked to hold first aid classes. The uniform consisted of slouch hats with a Red Hand badge, red ties and two rows of buttons. Their equipment usually included haversack, belt and jack-knife. Although Walter Carpenter was the first O/C, Seamus McGowan was seen as the real influence and inspiration. Apart from the original Beresford Place/Liberty Hall branch of the ICA scouts, another unit was apparently set up in Dún Laoghaire at one stage in 1915. The average age of the ICA scouts was fifteen and nearly all of them were involved in the Easter Rising. They were divided between the GPO and Stephen’s Green. Three of the ICA scouts were killed in action during Easter week. Fred Ryan, who had been a Fianna member originally, was by 1916 an ICA scout. However he is wrongly referred to as a Fianna casualty in many publications and books. He became close to James Connolly in 1914 and ‘defected’ to the ICA scouts. Another one labelled as a Fianna casualty was James Fox, who also had been a member of Fianna Eireann in 1913 but then joined the ICA scouts and was with the ICA in Stephens Green. He was shot dead on the Tuesday outside the United Service Club. Senior ICA scout Charlie D’Arcy was also sadly killed in 1916. As far as I know the ICA scouts discontinued after 1916 but I will research a bit further…. The photograph is available to view on John Kelly’s pension file at the Military Archives. Please note this is not a comprehensive account of the ICA Scouts and I am sure there is a lot more available material on that group, particularly prior to 1916. I would welcome any more information (or corrections) on the ICA Scouts so I can add to this short account. You will be given full credit for any material provided. This entry was posted on Sunday, April 27th, 2014 at 11:55 am	and posted in Fianna articles archives. You can follow any responses to this entry through the RSS 2.0 feed. « Limerick Na Fianna Eireann group photograph. Any info on paddy carroll?Charles was my great uncle on my mums side which is Darcy my mums maiden name was carroll I know carroll is a common name ,so my dad is carroll and mum Darcy . Hi eamon do you know if that is Charles Darcy bottom left of picture as you at it.